" Valentine died for love, Romeo also died for love, Jack in Titanic died for love, Samson in the Bible died for love, Greek Heroes Hercules & Achilles died for love. Even Jesus Christ died for love! I understand that the sarcasm, the joke or whatever the writer wants to convey. 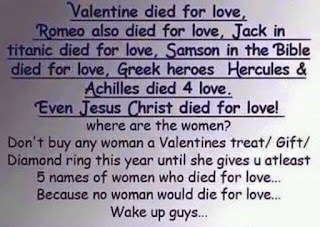 This seems to be anti-valentine's Day, anti-women or ignorance at it's best! I am not a woman, but I am writing to defend the women. Whoever wrote this pretended to know history but in reality he is ignorant of both of history and literature. I am not familiar much with history and literature either, but just a quick google search, is enough to find women who died for love. I am giving you 7 women who died for love. Read them. When the challenge comes up, you can mention 7, not just five. There goes my list. If you want more, read this 21 Women Who Died for Love in History, Literature and Folklore. Why include Jesus in the equation? 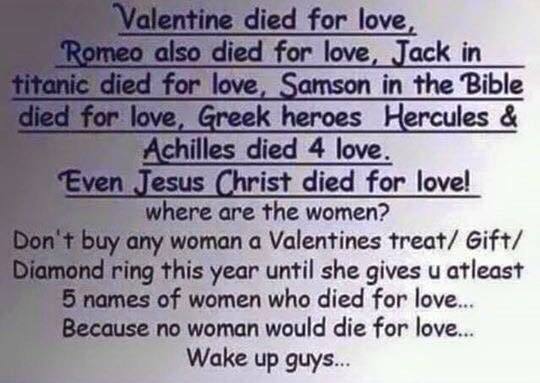 We'll then, it also fitting in the argument to say that not just 7 or 31 women died for love. In addition, the phrase "No woman would die for love," is out of the equation, because there are millions upon millions of women who would die for love. Mothers, would die for love! The writer of this meme deliberately ignored the multiplied millions of women who gave life to all men and women that exist in this planet. Some died while giving birth, unfortunately, and most would die for their child! Because the meme cited Samson and Jesus, I am going to point out one thing. Did you know that a wife is never commanded to love her husband? Neither Jesus nor any writer of the Scripture ever commanded a woman to love a man. As a mater of fact, the wife is never commanded to love her husband. Only the husband is commanded to love his wife, and to love her like Jesus love His bride-the church. How did Jesus love His bride? He died for her. Paul commanded the husbands to love their wives--like Jesus love the church. This is romantic love to the highest degree-husband willing to die for his woman! In contrast, the wife is never commanded to love and die for her husband. This is profound! The wife needs love but the husband does not. This does not mean that the wife should never love her husband. Love is not what the husband needs. What he really needs, apart from sexual intimacy, is respect. That is why, Paul commanded the wife to respect her husband!